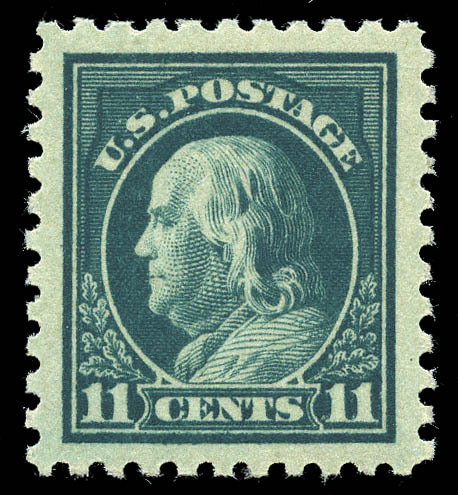 1916, 11¢ dark green (473), original gum never hinged, flawless centering within enormous margins, prooflike color. A Superb true jumbo. SMQ $5,000. THE ULTIMATE WASHINGTON-FRANKLIN STAMP AT THE HIGHEST GRADE POSSIBLE GRADE AND THE SOLE EXAMPLE OF THIS EXALTED GRADE. Expertization: with 2007 P.S.E. certificate graded Gem 100J.